Xia’s leg lengthening technique was based on more than 30 years clinical research and experience on leg lengthening surgery. Dr. Xia has redefined the concepts of leg lengthening and reformed, redesigned many surgical procedures and devices, overcome many shortcomings of the traditional techniques. Xia’s techniques is very safe, reliable, with high quality standards. This technique has shorter treatment duration, offers larger lengthening range and has no complications for low limb lengthening. Xia’s technique has turned the leg lengthening surgery from “dangerous procedure” to a safe one and the lengthening extent is no longer limited. Xia’s technique has extended leg lengthening surgery from treating diseased limbs to cosmetic surgery for normal limbs. There are six factors in Xia’s leg lengthening concept, which are also the golden standards for leg lengthening surgery. 1) Reconstruct and regenerate skeletal tissues according to their natural physiological rules. 2) Bone and soft tissues regenerate under the same tension-stress conditions. 3) No additional ligament (Achilles tendon) elongation surgery needed. 4) Remain physiological function and motion of the adjacent joints during leg lengthening. 5) Patients can endure pain free functional exercises and look after themselves during treatment. 6) The final results must meet the demands of height increase, maintaining normal limb functions and human beauty standards. It depends on the systems the doctors would like to use. In our institute, we normally use the dynamic lengthener in combination with external fixation system. The sites of operation can be at tibiae or femora. If the total lengthening is less than 10 cm, only tibiae are needed to be lengthened; if the lengthening is greater than 10 cm, then femora should be considered. 1) Lengthener constructs consist of external dynamic lengthener (Fig. 1) and inter-locking nail (Fig. 2). 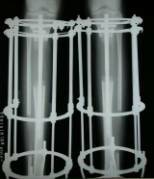 This lengthening system is designed by Beijing Institute of External Fixation Technology. 2) Medical examinations before surgery: imaging (x-ray or CT); blood check; cardiovascular function tests; routine urine tests. All the medical examinations are performed before 8:30am and the patients should fast for the morning when blood is taken.